This a debut collection of two youngsters. 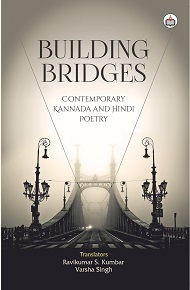 We must acknowledge that in their first attempt itself, they have succeeded in making the poems of Kannada and Hindi languages bloom in English. Both the translators have been translating their favorite poems occasionally and have brought out the same as an anthology now. There are differences in the translations of Kannada and Hindi poems. As expressed in one of the poems, even after the realisation of their difficult positions of belonging to different shores, the translators have aspired to build a bridge of love between these two languages. They are commendable for this effort. Instead of building new walls and confinements between people, languages, literatures, and cultures breaking them is more necessary in today’s world. And similarly, building bridges, any kind of bridges is better than burning bridges today. Varsha Singh (M.Phil., Ph.D.) is an Independent Researcher, Critic, Poet, Translator and Editor from Jharkhand. She writes in English and Hindi. Along with being the Managing Editor of Reviews, she edits for several national and international journals.She currently teaches at the Department of English, Guru Nanak College, Dhanbad. Her published books include Deluges: A collection of poems, 2014, (Authorspress), Unbangled and other Poems, 2015, (Authorspress), Bhor – A Collection of Hindi Poems, 2016 (Authorspress), The Midnight’s Grandchildren: Articulating the Postmodern Spirit in English Fiction of India, 2017, (Authorspress), Parbati the traitor and other poems, 2017, (Authorspress), Recluse: Contemporary Verses, 2017 (Ed., Authorspress), Critique on Transformational Art of Dilip Mohapatra (Ed., 2018, Authorspress). Ravikumar S. Kumbar "Benaka" completed his PhD from The English and Foreign Languages University, Hyderabad on the works of Edward Said. He translates from Kannada to English and vice versa. He writes poetry in Kannada.